About Our Inn The Mermaid & The Alligator Bed & Breakfast Welcome to the casual elegance and style of a more relaxed age. Our beautiful circa 1904 Victorian Home, located in the heart of Old Town Key West, offers the warm hospitality of a traditional bed & breakfast while providing our guest a place to relax, enjoy the ambiance, and even shut out the rest of the world if you choose. Join us and feel at home. Our home is " your home in Key West." Start each day with a wonderful full breakfast to keep you going whether your plans take you to the beach, out snorkeling and diving, or touring the many shops, galleries and restaurants of Duval Street, just three blocks away. The Mermaid & The Alligator Bed & Breakfast The Mermaid & The Alligator Bed & Breakfast	When you've seen all you want to, simply "come home" and relax in our beautiful garden setting, in the sun or shade. Enjoy the subtle music...cool off with a dip in our pool...recharge yourself. As night falls enjoy a complimentary glass of wine as you unwind to make your evening plans. The Mermaid & the Alligator at night Experience the best of Key West. It starts right here. Come home to The Mermaid & The Alligator. Each uniquely decorated room in our stately mansion has its own distinct personality, one is sure to match yours. Caribbean Queen Room The Caribbean Queen Room offers all the amenities of a great honeymoon suite or romantic weekend getaway. Watch the world of Key West go by from the wraparound veranda, relax in the large Roman soaking tub and get comfortable in the four poster queen size bed. The Garden Room Open the Garden Roomâ€™s French doors to let the warm, fragrant tradewinds in. This room with its cool terracotta floors, cathedral ceilings & warm tropical colors reflects our love of gardening and the Keys outdoor style of living. It features a patina metal canopy style bed and the bath has a large walk-in glass block shower, dual showerheads and glass ceiling. The Royal Poinciana is the perfect writer's retreat. Named after one of the stately trees in our garden, you are inspired to unwind on the outside veranda, sit and pen your thoughts at the antique writing desk or just relax in the comfort of its metal canopy bed with elegant bath featuring a marble shower and lots of mirror. The Royal Poinciana The Audubon Room Inspired by the art of John James Audubon, who visited & painted in Key West, the Audubon room boasts the original Dade County Pine walls & floors. Its large bath features a Jacuzzi bathtub and large open shower. Louvered doors lead you to our sunken "grotto" garden, patio and pool area. A bright & airy second floor room, in the bay portion of our Victorian home, the Sun Room's windows create a panoramic view into the trees. French doors open to a private sun deck overlooking the pool & garden. The private bath's step-in glass mosaic shower completes the room. A great retreat to sunbathe in the day & stargaze through the night! The Sun Room The Treetop Suite is nestled away on the third floor and aptly named for its view out across the neighborhood treetops. The splendor of the room is the exposed beam, cathedral, Dade County Pine ceiling highlighting the distinct gabled rooflines. The room features a king bed in one alcove and a large soaking tub open to the room in another with a private bath & shower. A private, romantic hideaway - above it all! 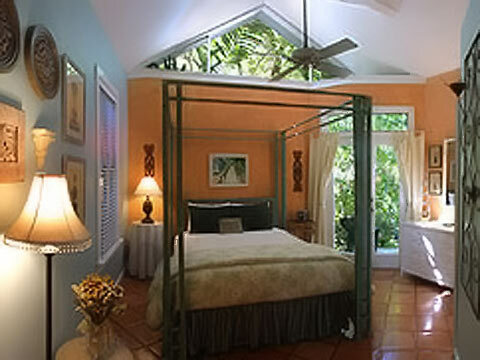 Treetop Suite Our historic 1880's cigar maker conch cottage sets the backdrop for the bright tropical colors and decor of the Bamboo, Papaya & Key Lime Rooms. These casual style rooms are reached by walking through the garden of the inn and still feature all of the amenities of the main house. All rooms have private outside entrances. The Bamboo Room is a large room with an Indonesian sleigh bed, sofa sitting area with tropical bamboo thatch ceiling. The room has a private bath with shower and a added bonus of a large covered porch area that looks out into out lush tropical garden & sunning patio...just steps from the pool & breakfast patio. The Key Lime & Papaya Rooms. These side by side rooms open to & share the front porch of our conch cottage. Yes, they are painted Key Lime & Papaya colors! You will definitely know you are staying in Key West. Quaint & cozy! While the Key Lime has a king bed, private bath with step-in shower, the Papaya Room features a queen bed and identical shower to the Key Lime. These two rooms rented together are perfect for two couples traveling together and are a great value. Amenities Our exquisite accommodations ... feature Sealy Posturepedic mattresses, 100% cotton sheets and luxurious white plush towels. Guests will find hair dryers, iron and ironing board as well as CD/AM/FM clock radio systems standard in all of our rooms. All rooms and living areas have air conditioning and daily room service. Our Living Room offers guests a unique, quiet and relaxing environment. Here you will find data port and high speed wireless Internet access. A guest computer for those who wish to work or check their e-mail with access to high speed Internet is available 24 hours a day free of charge as well as TV, phone, games and endless books and magazines to keep you occupied and inspired. Our concierge will assist you with all your outdoor activities and dining reservations needed through out your stay. We will be happy to arrange for bicycles or even a licensed massage therapist to help take the stress out of your busy schedule. Our Outdoor Pavilion is a great gathering spot to meet guests, enjoy a nightly complimentary glass of wine and gaze through menus of all the wonderful restaurants found in Key West. Here you will find the ice machine, guest refrigerator, pool and beach towels, sunscreen, beach chairs, coolers and umbrella! Our plunge pool heated year round and features built in benches and whirlpool jets. Surrounded by lush tropical vegetation, and wonderful patios areas perfect to transport you back to those times of ultimate leisure. Remember a full breakfast is served each morning poolside. Choose from a variety of yogurt, juices, fresh fruit and home baked muffins, coffee and tea. Than make yourself comfortable in the garden and let us offer you the hot entree of the day.